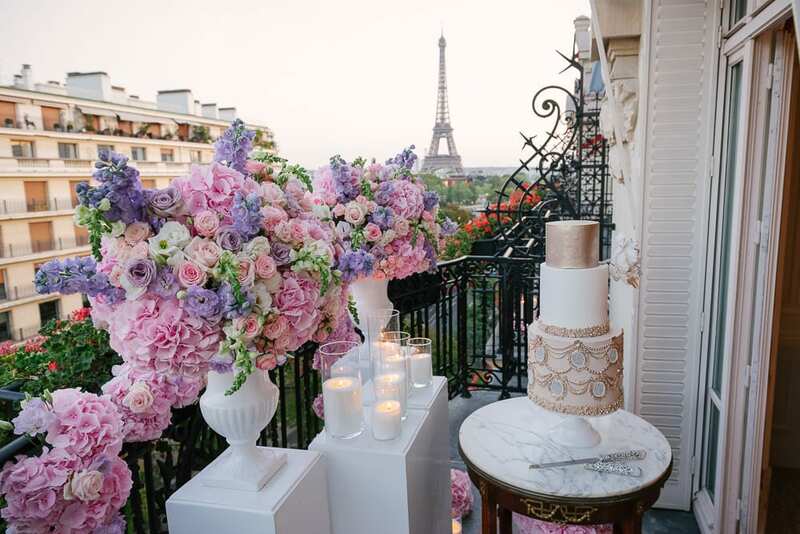 If your dream is to get divine pictures in Paris, then you are in the right place. Let’s explore together why spending at least two hours in the city of love, with a photographer in Paris whom you trust and like will help you get photos that look like they belong in a magazine. You will also get plenty of couple photo shoot ideas for fresh and unique pictures. 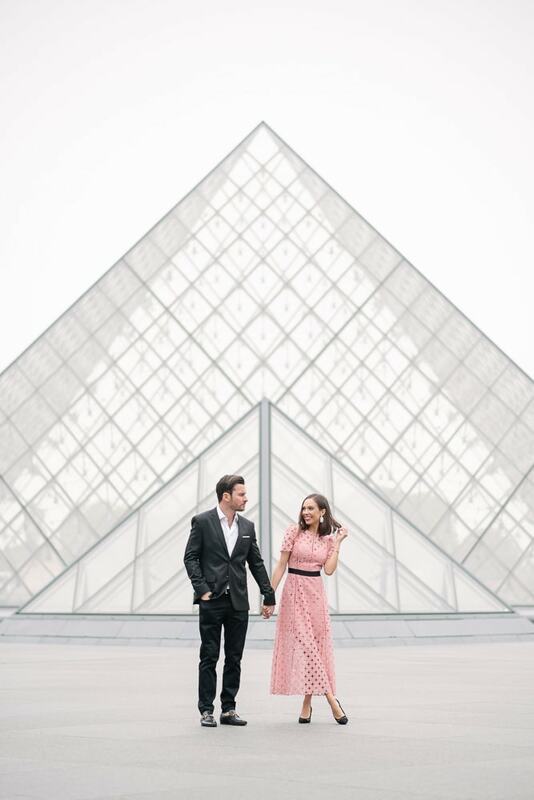 So get ready for beautiful pictures, helpful tips to prepare your Paris photo shoot and couple photo shoot ideas that will get you inspired. You are probably meeting your photographer for the first time on the day of your photo session. To get comfortable in front of his or her camera, will take a bit of time. And the best couple images are achieved when you both are comfortable with each other and with your photographer. Paris has so much more to offer than the Eiffel Tower. It has the most romantic settings: think of cute cobblestone streets, amazing monuments, charming Parisian cafés and adorable secret locations. Having more time for taking photos, means that you’ll have more variety in the images that you will proudly show to your friends. The most flattering light is at sunrise and sunset. Given that Paris is probably the most visited city in the world, at sunset there are simply too many people around, especially in the iconic places. This is the reason, why when you book 2 hours or more, your get the choice to schedule your photo session at sunrise or sunset. We absolutely love when our couples prepare for their photo session with us and even come up with fresh couple photoshoot ideas. Even more, we encourage you to put together an inspiration board and show us the photos prior to the meeting day. This way our and your expectations are perfectly aligned. We understand. But who doesn’t like to have fun ? 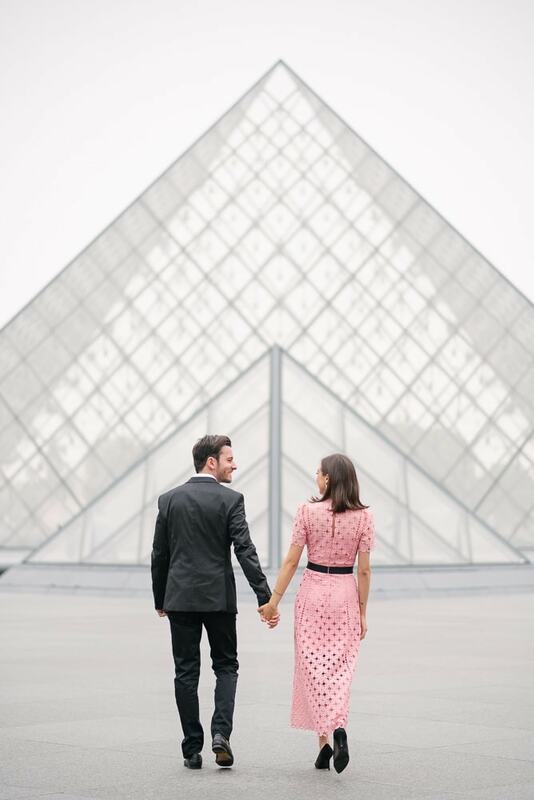 Our photo shoots in Paris focus on the experience of discovering the most romantic city in the world and on having fun, just the two of you. 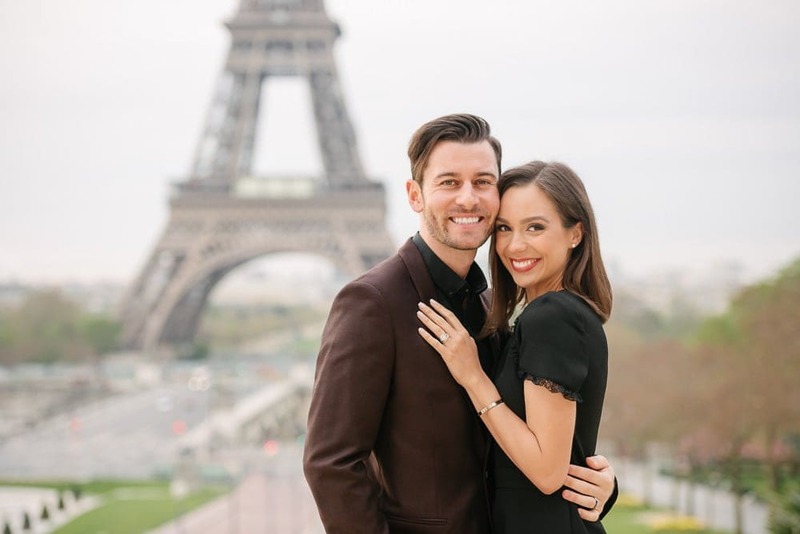 You have probably already planned what photoshoot outfits you will wear for your Paris photos. And it makes total sense to have several outfits to show different beautiful looks. Perhaps a formal attire, followed by a playful outfit. Or why not a playful attire with a casual look. Whatever you will choose, it’s guaranteed to offer you more variety for your photos in Paris. 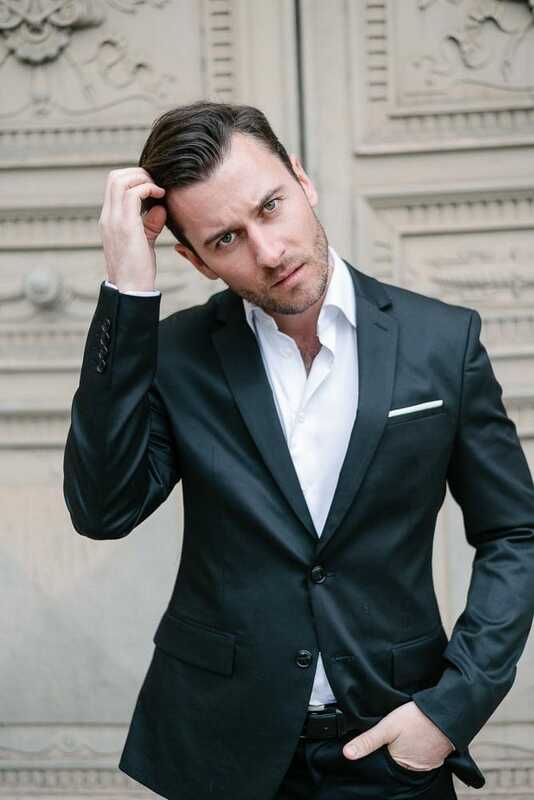 To get more inspiration for your attire choices, check out our “How to dress guide“. When you meet the photographer, it’s ideal to be dressed already for the first location. 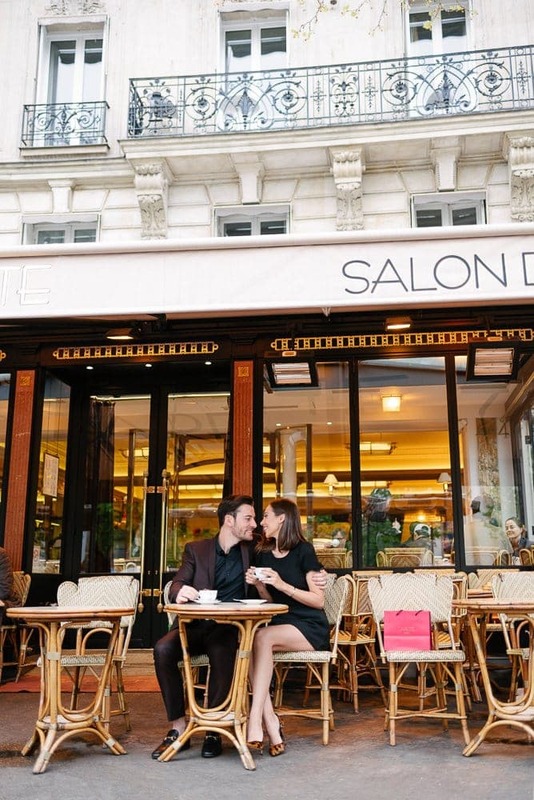 During our 2 hours photo shoots, we typically stop in a Parisian café for an attire change and cute piece of life pictures. 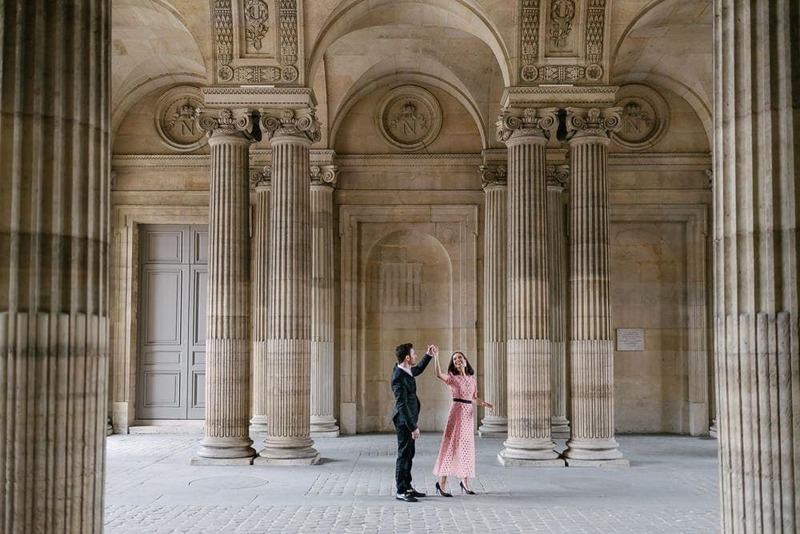 The pictures on this page were taken during Molly & Edouard’s honeymoon photo shoot in Paris in April, 2018. 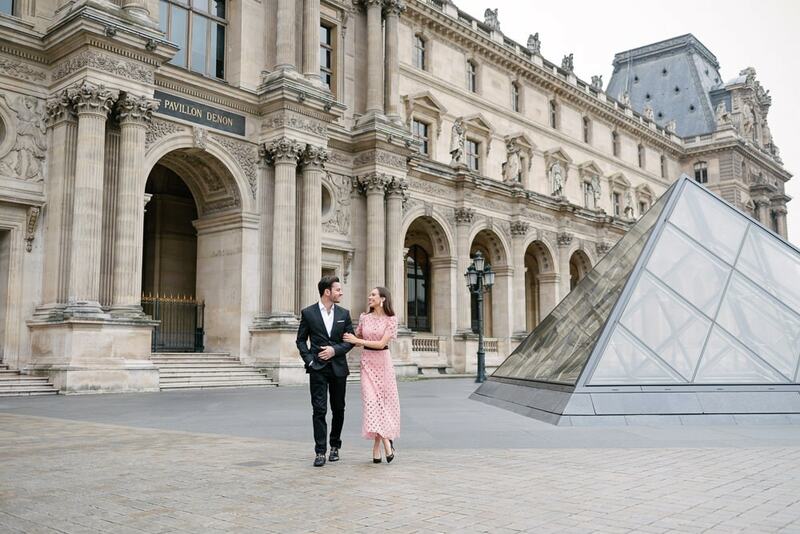 It features 3 locations (Eiffel Tower, a Parisian Café and the Louvre Museum) and one outfit change. 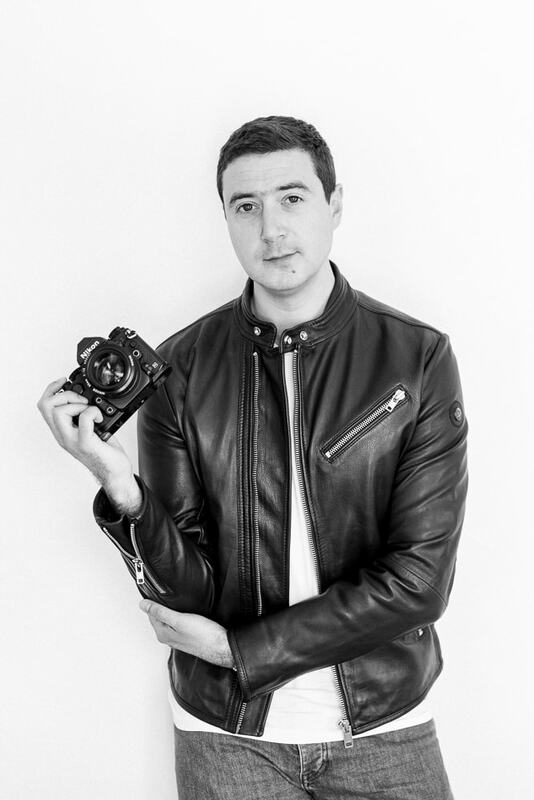 Our goal is to create images in the best light and with the beauty of Paris around you. It will seem that the city was shut down just for you. Every couple is different and the way you connect with each other is unique. 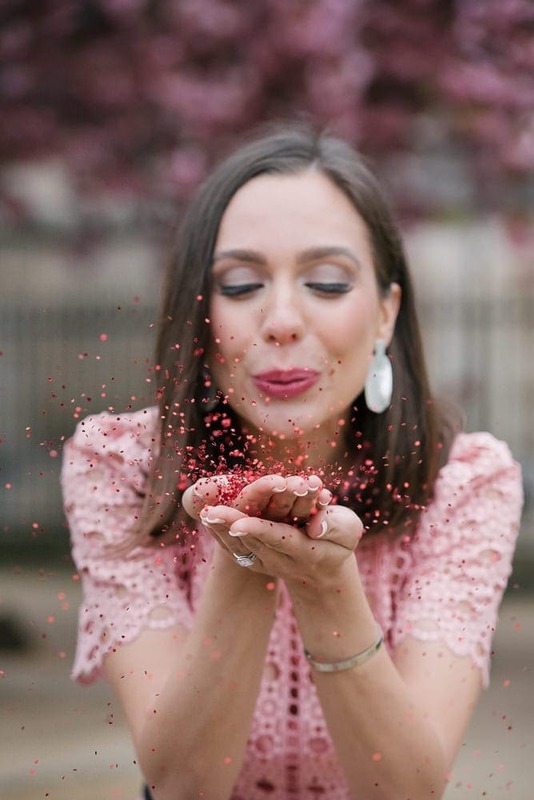 We focus on showing your connection, your love story. Candid and spontaneous moments are the heart of our style. Cute details and close-up shots will add more beauty to your photos. How important is professional make-up and hair ? Let’s be honest, it can change the way you look and feel in the pictures. But then, if you know how to get the look that you like, then it’s not necessary to indulge in professional beauty services. Either way, we can recommend you some of the most talented Parisian beauty artists. If you are booking a sunrise session in summer, please be aware that the starting time is around 6AM. This means that you have to get ready very early and sometimes getting more sleep equals looking more beautiful. WHAT PROPS LOOK GREAT ? First thing first, you don’t need props. 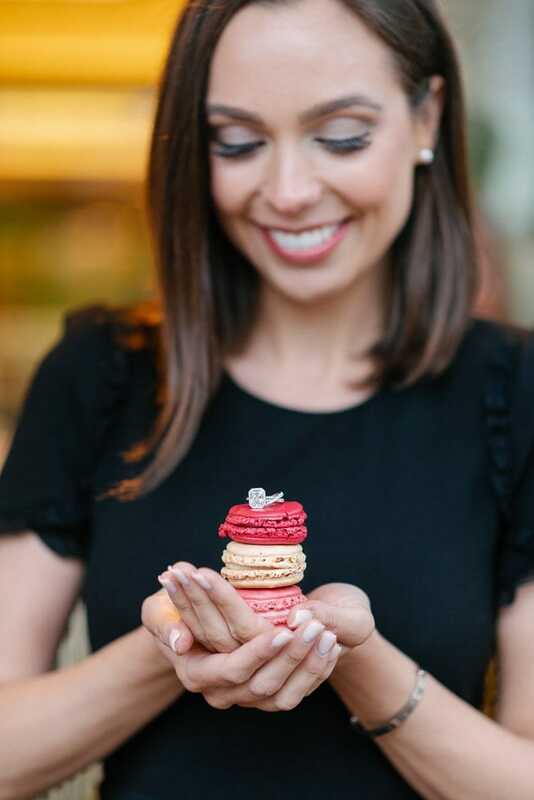 However, if you’d like to step it up, from the romantic and cute photos, props will give an extra dimension to your Paris photography gallery. Think about, what would fit your personality. Is it flowers, or a hat, colorful balloons or champagne. Our suggestion is to pick one or two props. Like with everything in life, overdoing it might take away from the beauty of the pictures. Props can also be something meaningful. Something that could remind of how you met or about your first date. Or about your first trip to Paris. Exploring our Paris photos galleries, you’ll notice that our Paris photography style is distinctive. However, we are flexible and adapt to our couples personalities. For example, if you’d like to have more fun photos than romantic, that is great. Even more. If you’d like to have more spontaneous and less posed pictures, it sounds amazing. The best way to tell us, what kind of pictures you like the most is by creating an inspiration board, ideally on Pinterest. 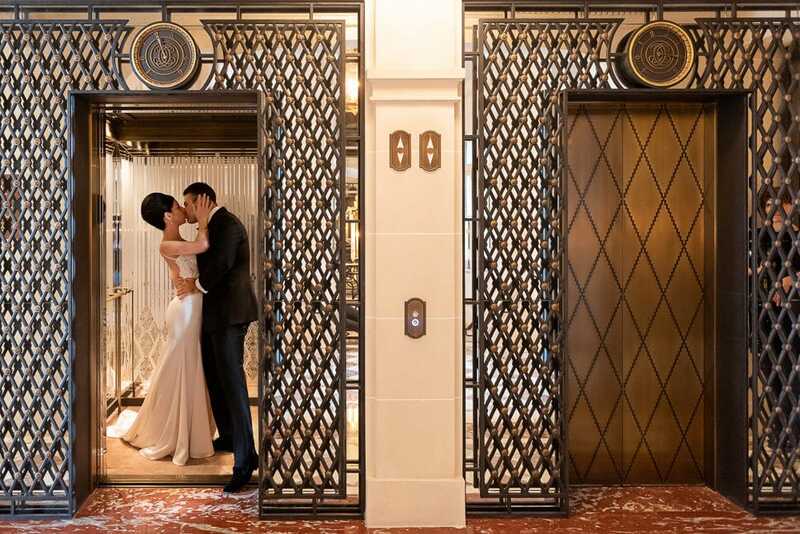 Smart couples tend to separate their inspiration boards, such as things to do in Paris, where to eat in Paris and Paris couple photoshoot ideas. 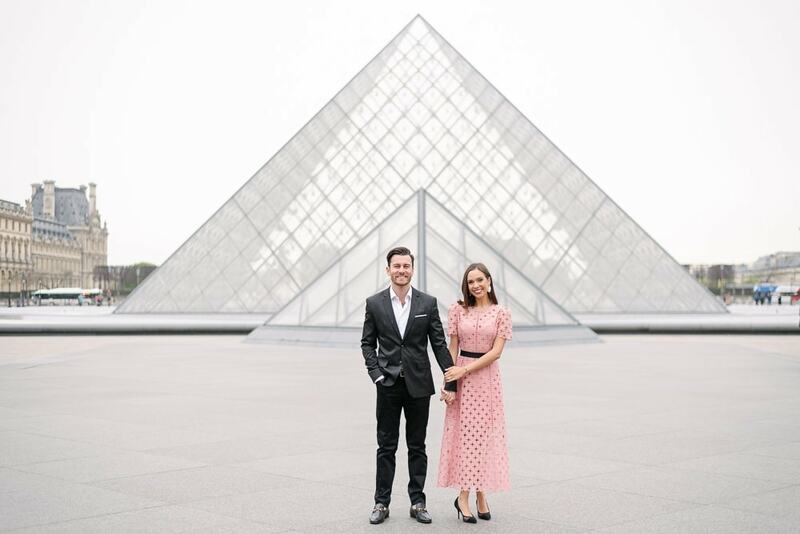 I would recommend this experience to any couple, family or fashion enthusiast that wants beautiful images admits iconic scenery … nothing beats Paris ! In conclusion, two or more hours of photography in Paris will allow you to get more variety for your pictures. Regardless if you are taking engagement, honeymoon, anniversary, wedding or just for fun photos. You’ll also have more fun and you will be able to contribute with unique couple photo shoot ideas. 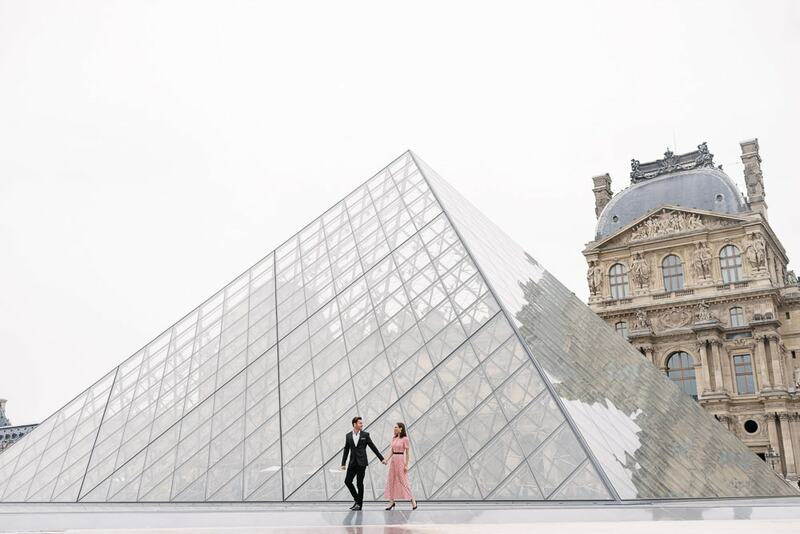 The images below represent a typical two hours honeymoon photo session taken at the Eiffel Tower and Louvre Museum. 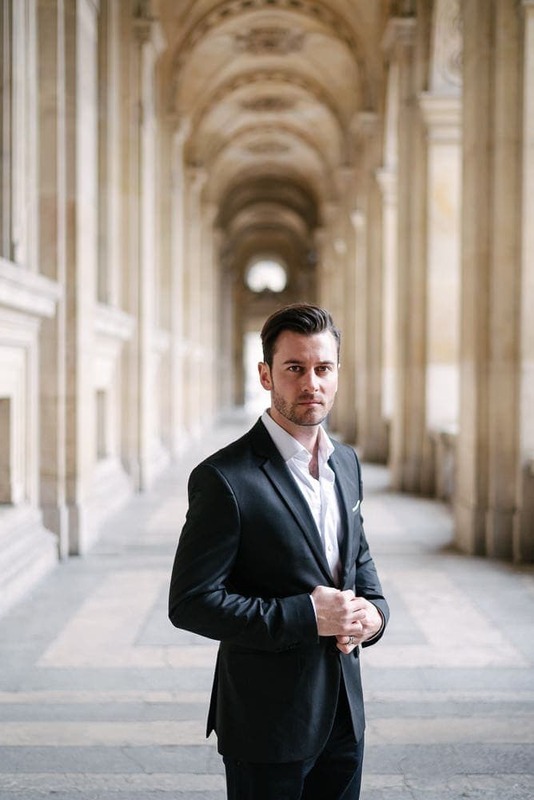 Whether you are looking for an example of a multi hours photo session in Paris or a mini photo shoot, we are here to guide you and make sure that you get breathtaking souvenirs of your Parisian adventure. thank you for getting in touch so far in advance. My studio manager will send you a message shortly with our collections and availability. Looking forward to having you on board and creating magical memories together. thanks for writing us. Although, the best way to get in touch is via the contact form on the Contact page, or simply send us an email. So many great ideas!! What are your favorite props?